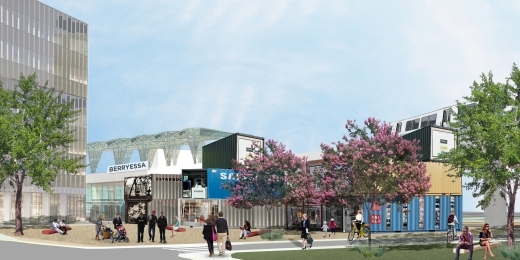 Among other recommendations, SPUR proposes creating a lively retail park out of shipping containers at the future Berryessa BART station. Rendering by Gensler. It is a rare opportunity for a city to receive regional rail service. With the extension of BART into Silicon Valley, San Jose has a unique chance to shape growth around its first station, at Berryessa. Developing land uses near the station that support transit ridership will be key to the success of BART in the South Bay — and to the future of the Berryessa area. This means new development needs to be of the type and intensity that will encourage people to walk from the station to this development, and vice versa. Substantial planning has already been done, and yet there are still opportunities to make improvements. This report acknowledges the significant planning efforts made to date, while presenting new concepts that are meant to start a conversation about the future of this very important area.